Eastern Pines is an overnight backpacking trail with loops of 6 - 15 kilometres in length. The trail can be accessed from Grand Lake - Achray Access Point. 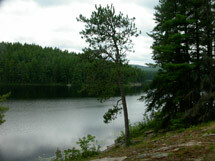 Eastern Pines Backpacking Trail is located at Grand Lake - Achray Access Point. Open from the last Friday in April to Thanksgiving (mid-October). Difficult. Steep climbs, side slopes and sharp turns. Contact Algonquin Park Information for more information on trail conditions. A valid camping permit is required for trail use.